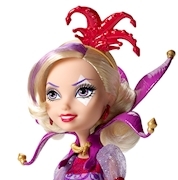 Join the fun at Ever After High™ with this Courtly Jester™ doll! In the Netflix Original Series, “Way Too Wonderland,” Raven Queen™, daughter of the Evil Queen, magically transports herself and her friends to Wonderland. There they meet Courtly Jester™, daughter of the Joker Card, who is a wild card herself. In true Wonderland fashion, the Courtly Jester™ doll wears an iconic outfit with bright colors and card-inspired print. Fans of Ever After High™ will love this doll with her colorful hair streaks, iconic makeup and jester-inspired accessories, like a fabulous hat. 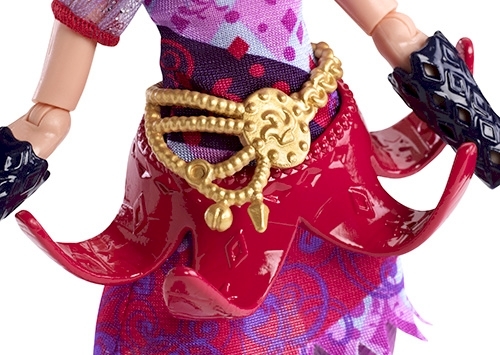 Use the included brush and doll stand to capture Courtly Jester™ doll in a mischievous pose or a fun fashion moment. Collect all of the Ever After High™ characters for Wonderland-iful storytelling and display (each sold separately, subject to availability). 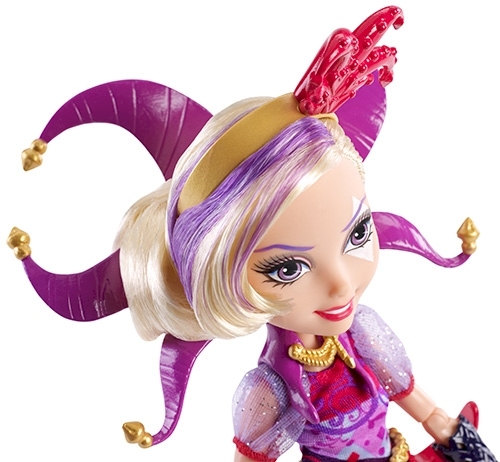 Includes Courtly Jester™ doll wearing fashion and accessories, doll stand and doll hairbrush. Doll cannot stand alone. Colors and decorations may vary.